By understanding how the interview works and, crucially, what it is that the interviewer is looking for. 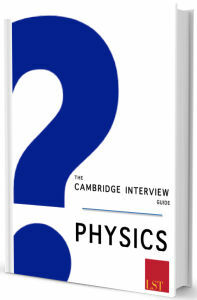 The interviewer is not looking to catch you out, but rather for you to demonstrate your curiosity, knowledge and passion for Maths. The easiest way to demonstrate your enthusiasm for Maths is to show that you are self-motivated and have studied the subject in your free-time for enjoyment – for example through online lectures and independent reading. If you don’t know where to start, review our suggested reading list below. 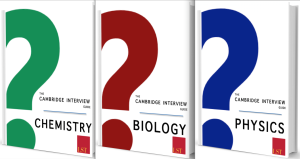 For a limited time the Cambridge Interview Guides are available to download for only £30 each. How many 0s does the number 30! have? How long does a mirror have to be for you to see your whole body? Show that if n is an integer, n^3 – n is divisible by 6. A body with mass ‘m’ is falling towards earth with speed v. It has a drag force equal to kv. Set up a differential equation and solve it for v.
What was the most beautiful proof in A-Level Mathematics? What do you think is beautiful in maths? Consider two identical, frictionless slopes, down which we send two identical particles. If each particle starts the same height up each slope, but one rolls whereas the other simply translates down the slope, which particle will reach the bottom first? Differentiate x^x, then sketch it. Is it possible to cover a chess-board with dominoes, when two corner squares have been removed from the chessboard and they are (a) adjacent corners, or conversely, (b) diagonally opposite. Integrate 1/(x^2) between -1 and 1. Describe any difficulties in doing this? If a cannon is pointed straight at a monkey in a tree, and the monkey lets go and falls towards the ground at the same instant the cannon is fired, will the monkey be hit? Describe any assumptions you make. How many solutions to kx=e^x for different values of k? Prove by contradiction that when z^2 = x^2 + y^2 has whole number solutions that x and y cannot both be odd. Sketch y=ln(x) explaining its shape. Compare the integrals between the values e and 1: a) int[ln(x^2)]dx; b) int[(lnx)^2]dx and c) int[lnx]dx. Which is largest? What is the square root of i? If each face of a cube is coloured with one of 6 different colours, how many ways can it be done? If you have n non-parallel lines in a plane, how many points of intersection are there? Sketch y = (x^4 – 7x^2 + 12)/(x^4 – 4x^2 +4). Sketch y^2 = x^3 – x. Integrate from 0 to infinity the following: Int[xe^(-x^2)]dx and Int[(x^3)e^(-x^2)]dx. If you could have half an hour with any mathematician past or present, who would it be? What is the most pieces of pizza I can get from ‘n’ cuts? I am an oil baron in the desert and I need to deliver oil to four different towns which happen to lie on a straight line. In order to deliver the correct amounts to each town, I must visit each town in turn, returning to my warehouse in between each visit. Where should I position my warehouse in order to drive the shortest distance possible? Roads are no problem since I have a friend who is a sheikh and will build me as many roads as I like for free. I drove to this interview at 50 kmph and will drive back at 30kmph because of the traffic. What is my average speed? Derive the formula for the volume of a sphere. Do you know what a hyperbolic function is? e^x = y^x. For what value of x is there only one solution? How would you prove that any integer can be expressed factors or is itself a prime number? How many 0s has 30 factorial? How would you derive pi? How would you prove that e is irrational? How would you prove that the square root of 3 is irrational? How would you write down 0.1 recurring as a fraction? Integrate ysiny with respect to y. There are 30 people in one room. What is the probability that of them have the same birthday? What do know about Fermat’s last theorem? What is the significance of Euler’s equations? Why do we approximate many functions in maths as cosine?